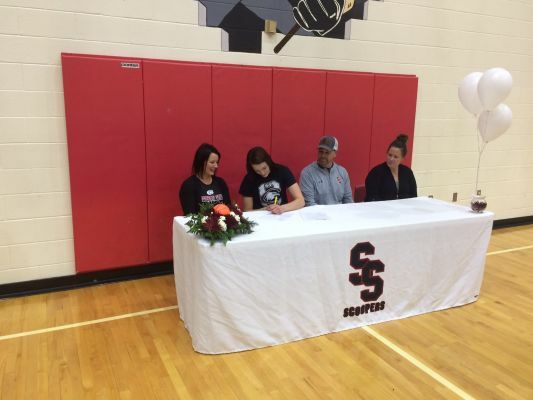 Sturgis Scooper Olivia Jolley signs her letter of intent to play basketball at Chadron State next year. Jolley is joined by her parents and head coach Jordan Profrock. STURGIS, S.D. - The Sturgis Scooper girls basketball season hasn't started yet, but Senior Olivia Jolley already knows where she would like to continue her basketball aspirations next year. Jolley on Wednesday signed a letter of intent to play basketball at Chadron State College for the 2019-2020 season. Until then, Jolley is getting ready for a big season with the Scoopers. She told KBHB Sports Wednesday that she is excited about the upcoming season and has big hopes for a strong team. "I'm really excited for this year. We have a lot of core players coming back, and we've been working hard to get better." Head Coach Jordan Proefrock was excited for Jolley's Chadron State commitment, but also looks forward to Jolley's senior season. Former Scooper head coach Mike Freidel will join Proefrock as an assistant coach this year. Freidel has spent the past few seasons as assistant coach under Colin McCampbell on the Scooper boys basketball team.